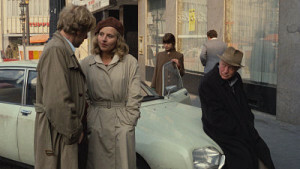 Though they are alike in tone, the three films have no narrative connection except for a laidback lead character played by Wenders’ alter-ego in the Seventies, Rudiger Vogler. Vogler’s characters have different professions in each film, and he’s a much more somber fellow in the second one, but he grounds the pictures with his depiction of a loner whose journey is altered by his travel companions. Alice in the Cities (1974) concerns a photojournalist (Vogler) who winds up being saddled with a little girl (Yella Rottlander), but it is far from the American Little Miss Marker model of parent-child surrogate comedies. It’s an utterly charming, sentiment-free depiction of a child – one can easily imagine it being remade as a dreadfully saccharine Hollywood movie. The film is a low-key gem, perhaps even more touching because Wenders avoids trite, conventional cliches about children and their effect on their adult companions. Based on a novel by Goethe, Wrong Move (1975), finds Vogler playing a would-be writer who winds up taking a road trip with a famous actress (Hanna Schygulla, The Bitter Tears of Petra von Kant) and two street performers, played by Hans Christian Blech and 13-year-old Nastassja Kinski (her movie debut). The film is very different from the other two in the “trilogy” as it was fully scripted by novelist Peter Handke and is thus as “literary” as it cinematic. It is also in color, which should be an asset, but its chromatic allure is surpassed by the gorgeously crisp and evocative black and white imagery found in the other two films. Kings of the Road (1976) is the longest film of the trio (176 mins) and yet feels even breezier than Alice. Wenders perfected the art of filming action “in real duration” during this period, and thus the viewer feels as if he or she is along for the journey with his two leads. The plot is very simple: Robert (Hanns Zischler) is a suicidal drifter who winds up joining a movie-projector repairman (Vogler) as he travels through small towns across Germany. While crafting a low-key but still compelling character study, Wenders also imparts a very pointed message about the death of the small town movie theater (and this a quarter century before the “digital revolution” took hold). The supplements included in the set shed much light on the production of the films, as well as conveying Wenders’ youthful sense of invention. Two of his earliest shorts are present, as is a featurette exploring the digital restoration carried out on Wenders’ early features. Interviews with key cast members are also included (minus Schygulla and Kinski, as could be expected). Among the Alice interviews is Rottlander. She comments at length on how “natural and innocent” the relationship between the two lead characters is, noting that if the film were made today, viewers would be instantly suspicious of the friendship between an adult man and a little girl. Rudiger Vogler’s comments on Wrong Move focus on his performance (which he’s not satisfied with) and a lengthy sequence in which he and the other characters talk as they walk on a roadway located on a steep hill. He notes that the scene was shot by a camera situated in a car being pushed by the crew. When cast members were not on-camera they were asked if they, too, could help push the car slowly up the hill. An hour-long interview of Wenders by filmmaker Michael Almereyda finds him recalling the particulars of each shoot. He stresses the important contributions of his regular collaborators – cinematographer Robby Mueller, editor Peter Przygodda and sound man Martin Mueller – and proudly declares that Kings was made by a crew of just a dozen people traveling across Germany. Two of his anecdotes are especially colorful. The first – which is coincidentally also told by Wenders in the supplements in the Criterion edition of The American Friend and the recent Olive Film release of Dead Pigeon on Beethoven Street – concerns a day he spent with the legendary maverick filmmaker Sam Fuller, who convinced Wenders he must resurrect a film project he had killed off, that project being Alice (which was his fourth feature, but his first to turn a profit). 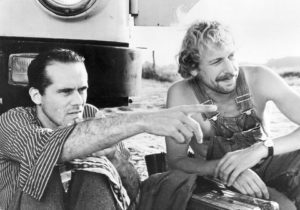 The second and much odder anecdote involves a scene in which Vogler quietly and quickly defecates on-camera (his character lives out of his truck). Wenders maintains that he was unsure about whether the scene should be removed or not. He initially wanted it gone, but editor Przygodda argued to keep it. Wenders was later told by an official at the Cannes Film Festival that if the scene was removed the film would likely win several awards. Wenders insisted that the scene remain, and instead the film won only a critics’ award. 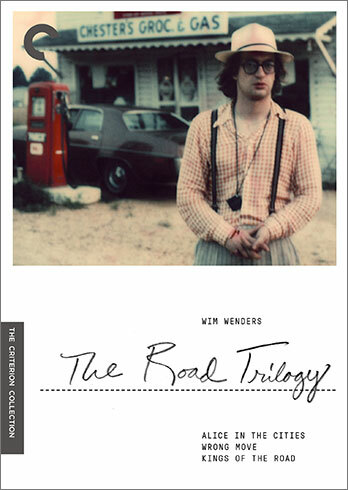 Wenders supplies an audio commentary for all three of the films, two in German and one in English. The latter, for Wrong Move, contains an unexpected sound: Wim giggling. As he talks about a scene that had to be shot over and over, thanks to the teenage Nastassja Kinski breaking into fits of giggles, Wenders himself begins to laugh. 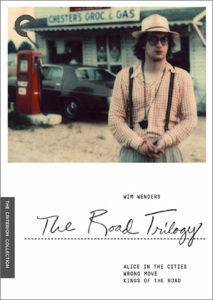 Wenders’ films have included humorous moments (Kings of the Road contains a surprisingly adept physical comedy routine by its two stars), but it’s quite unusual to hear the usually somber Wenders emitting a jarring giggle as he discusses how Kinski made the entire crew crack up each time she dissolved into laughter.